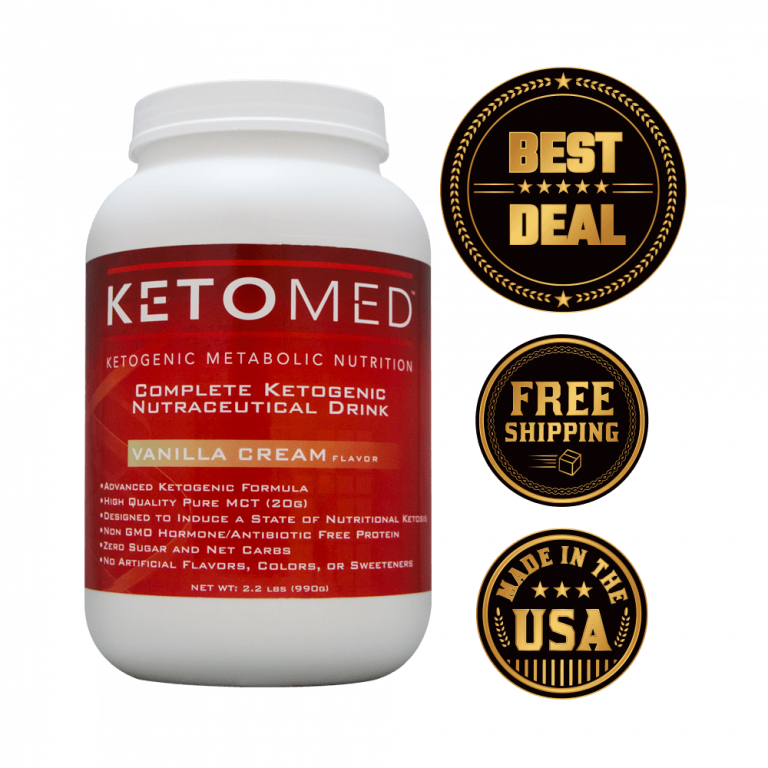 KetoMed is the perfect over-the-counter Ketogenic Nutraceutical Food for assisting with a classic Ketogenic Diet, or healthy low carb/low grain lifestyle. KetoMed is scientifically formulated to induce a quick, long-lasting and deep state of Nutritional Ketosis, whereby your system creates a state in which your body switches fuel sources and produces ketones and burns fat as its primary fuel source rather than glucose. This unique, scientifically formulated high fat extremely low carb ketogenic formula delivers 75% of its calories from the highest quality MCTs, or medium chain triglycerides, 15% hormone and antibiotic free clean protein and less than 2% total carbs with zero total or added sugars. 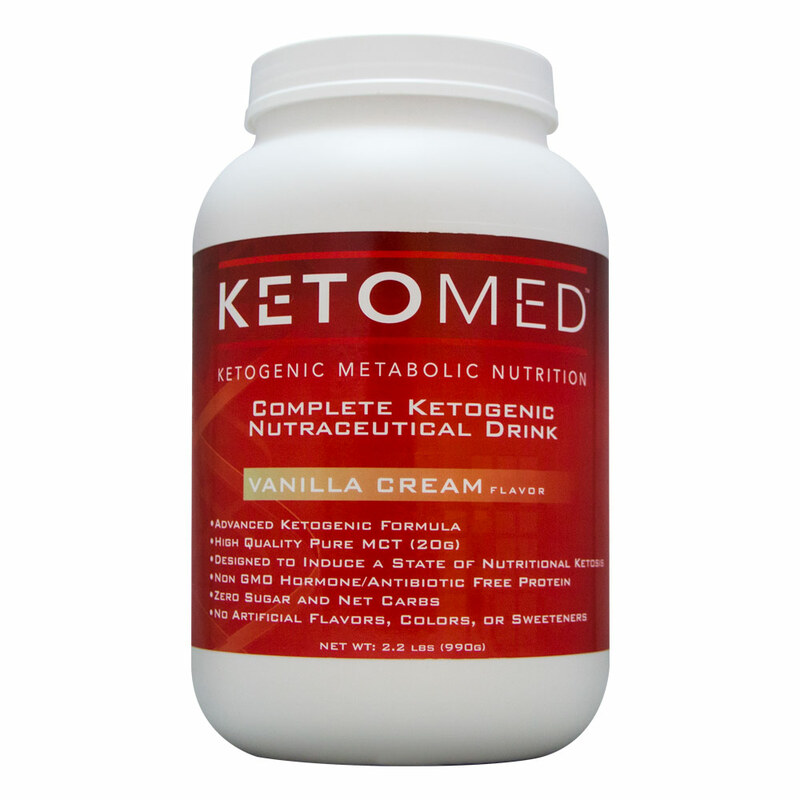 If you like ice cream then you will love the flavor of KetoMed Vanilla Cream. 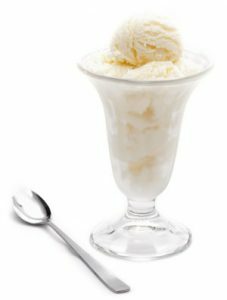 The taste of this premium Ketogenic Food is much like that of a gourmet vanilla ice cream scoop! 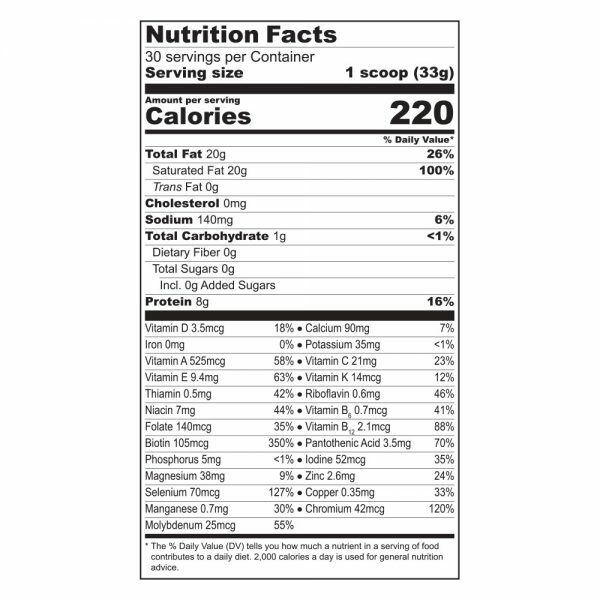 KetoMed contains no: corn, maltodextrin, citric acid, yeast, peanuts, soy, wheat, gluten, sugar, starch, emulsifier, wax, filler, lubricant coating, flowing agent, common allergens, colors, artificial sweeteners, chemicals, preservatives, GMO's, antibiotics or hormones. The MCT's contained in KetoMed have powerful antifungal agents that assist not only with pre-existing gut problems but also help fight yeast and other fungal or Candida issues within the body. Among these antifungal agents, caprylic acid, an extremely healthy fat, is considered the most effective. As MCT is ingested, it begins to kill Candida yeast cells by interfering with the makeup of their cell walls. To help achieve this, KetoMed incorporates high-quality pure MCT that can provide the support needed within the body to clear up any fungal or Candida issues that may be present. Generally speaking there are no negative side effects. Only side benefits, however, given the high potency levels of MCT, some people may experience slight gastrointestinal discomfort at first as the body becomes adapted. Keep in mind that KetoMed has potent antifungal & antimicrobial properties that may cause a Candida/fungal die-off reaction in those with compromised immune systems. (This is a good thing) If you do experience this then simply start using KetoMed by cutting the serving size in half until you can drink the full serving with no problem. Most people will be able to tolerate immediately. * Note: high potency purified MCT’s (Medium Chain Triglycerides), react differently in the digestive system compared to long chain fatty acids (the type of fat found in most foods) The long chains of LCTs require a lot of bile acids and many digestive steps to be broken down into smaller units that can be absorbed into the bloodstream. Once in the bloodstream, they are absorbed by fat cells and stored as body fat. MCTs are a special class of fats with positive effects on energy, metabolism, fitness, fat loss and aging. Medium Chain Triglycerides (MCTs) are a unique form of dietary fat that impart a wide range of positive health benefits. Nevertheless, if your digestive system isn’t used to pure MCT, you may experience mild nausea, stomach upset, bloating and or mild gastrointestinal distress. (This is temporary) Some individuals are more sensitive to it than others, whereas others have no problem at all. Do not feel alarmed if you experience any of the aforementioned effects. It is completely normal until you become nutritionally adaptive to absorbing and digesting MCT fat. The simply solution is to take half the serving size or smaller and gradually increase until you can enjoy a full serving of KetoMed with no problem. This may take 5 to 10 days to adapt. Another solution is to use a KetoMed drink as a meal replacement later on in the day after you have consumed several meals earlier in the day. Most people will find that these possible side effects will decrease and eventually disappear with in 5 to 7 days. It can be more or less depending upon the individual. KetoMed is packaged to provide a full month’s worth of product when used according to the label directions. With this in mind, we have a Preferred Delivery subscription option that allows you to get KetoMed delivered to your door every month. For a limited time use coupon code SAVE40 to save $40 on your Preferred Delivery subscription. Lock in this discounted price for as long as you remain on the plan! Warning: Not for use by individuals under the age of 18 years. Do not use if pregnant, nursing or trying to become pregnant. Consult a physician or licensed qualified health care professional before using this product if you have, or have a family history of heart disease, thyroid disease, diabetes, high blood pressure, depression or psychiatric condition, glaucoma, difficulty urinating, prostate enlargement, or seizure disorder. We believe that implementation of a calorie controlled Ketogenic diet would be an effective Metabolic approach for targeting energy metabolism in most malignant and metastatic cancers. It is our opinion that a therapeutic Ketogenic diet, consumed in restricted amounts, will be effective in maintaining reduced glucose and elevated ketones.